Colin Shaw is without question a world leader in Customer Experience. Since 2002, Colin has helped shape the whole industry with his four bestselling books and thought-leading work. This has led LinkedIn, the leading business social media website, to pronounce Colin as one of the top 150 business influencers worldwide. At the time of writing, Colin has 175,000 followers on LinkedIn. In 2002 Colin founded Beyond Philosophy, a global Customer Experience consultancy, and remains their CEO. He travels over the globe from their headquarters in Tampa, Florida. Beyond Philosophy specializes in helping organizations create deliberate, emotionally engaging Customer Experiences that drive value, reduce costs, and build competitive advantage. Before launching Beyond Philosophy, Colin held a number of senior executive positions at Xerox, Mars, and British Telecom (BT). He was ultimately appointed Senior Vice President of Customer Experience at BT, where he led a team of 3,500 employees worldwide. Under Colin’s leadership, Beyond Philosophy has undertaken many Customer Experience initiatives with some of the world’s biggest companies, including American Express, FedEx, Maersk Line, Aflac, Aviva, T-Mobile, and IBM. In the case of Maersk Line, Beyond Philosophy helped them increase their Net Promoter score by 40 points in 30 months. This led to a 10% increase in shipping volume. Colin has also advised governments, has been a visitor to the Cabinet Office in No. 10 Downing Street on a number of occasions, and has also spoken to the U.S. Republican party Chiefs of Staff on improving their constituents' experiences. A sought-after keynote speaker, Colin’s interactive presentation style uses thought-provoking questions, humor, and real-life anecdotes to engage, entertain, and inform his audience. Colin is a member of the National Speakers Association, and has presented countless keynote speeches. He has been featured as an expert on CNN, BBC TV, Sky News, and BBC Radio. Colin has been quoted in many publications such as The Times, Marketing, Marketing Week, and Customer Management to name a few. 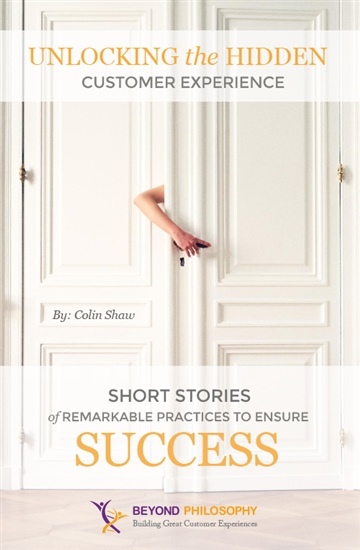 Colin now indulges in his real passions: creating and managing organizational change, strategic thinking, developing original concepts, inventing innovative but realistic solutions, and critically working out how these can be practically implemented. Colin is a devoted family man and lives in Sarasota, Florida. He is a keen boater, angler, and supporter of the Tampa Bay Buccaneers and Luton Town Football Club. Colin collects 1966 World Cup Soccer memorabilia.